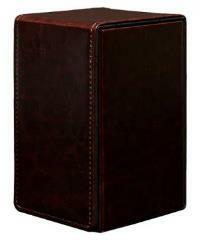 Store and protect your valuable trading card game cards, dice and tokens with these premium Alcove Tower storage cases made with a unique "Cowhide" finish. The Alcove Tower Deck Box can hold up to 100 double sleeved cards with its lid secured by strong magnetic closures utilizing multiple magnets for extra protection. The lid can be undone on both sides of the box to reveal dual thumb notches for easy access to your deck of cards. The Alcove Tower also offers an interior drawer compartment for storing dice, tokens and other small accessories. Show up at your next gaming session in unique style with Ultra PRO's Alcove Tower series of premium Deck Boxes!